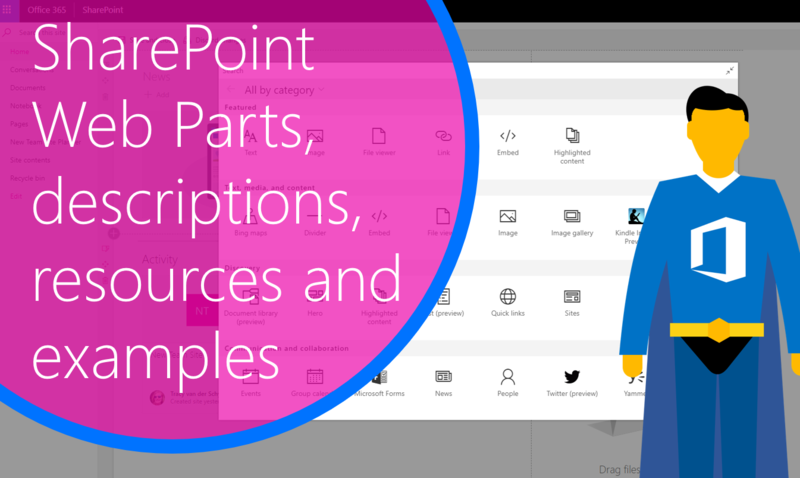 Found a great blog by #Microsoft this week on the web parts in SharePoint Online, which I’ve taken and added images as examples. This really helps if you’re new to #SharePoint Online and you’re not quite sure what web part to use yet. Together with Microsoft’s descriptions and resources, this should have you sorted in no time. Below you’ll see the available web parts and descriptions. I’ve added some images for more info. Web Parts aren’t necessarily A-Z as I’ve grouped some of the web parts. Use the Bing maps web part to add a map to your page. Simply enter an address or a well known name and your map will appear. You can choose a different map type, such as road or aerial. You can also change the zoom level or give your map pin a friendly name. Use the Bing Maps web part on a page. You can display content on your page from other sites like YouTube videos. Depending on the site, you can either use the site’s address or embed code that the site provides. Use the Embed web part on a page. This web part allows you to control vertical space on your page. Add vertical space to a page with the Spacer web part. With the Connector web part, you can get messages, alerts, and notifications from your favorite external services on a group-connected team site page. For example, you can show updates from services like Trello and Facebook; alerts when something new is published in an RSS feed; notifications from JIRA or GitHub; or even summaries from Salesforce and Google Analytics. Use the Connector web part. I haven’t used connectors yet, and when I tried it said the Group for the Team hadn’t ‘integrated’ yet. We’ll try again at some point. Use this to web part to insert a line between other web parts to help break up your page and make it easier to read. Add a line between web parts with the Divider web part. 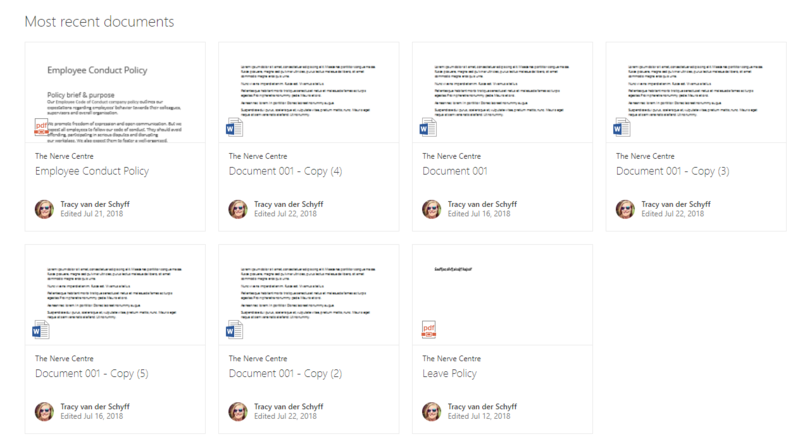 The Document Library web part allows you to display a document library and customize it with your own title, view, and even size. Users with appropriate permissions can view or edit files directly from the web part, or can go the full document library by clicking See all. Use the Document Library web part on a page. The Events web part allows you to add and display upcoming events on your page. You can even include a map with location, online meeting information, and more. Use the Events web part. Use this to insert a file on your page. File types you can insert include Excel, Word, PowerPoint, Visio, .PDFs, 3D Models and more. Use the File viewer web part on a page. Use this to insert an image on the page, either from your site or your hard drive. Use the Image web part on a page. 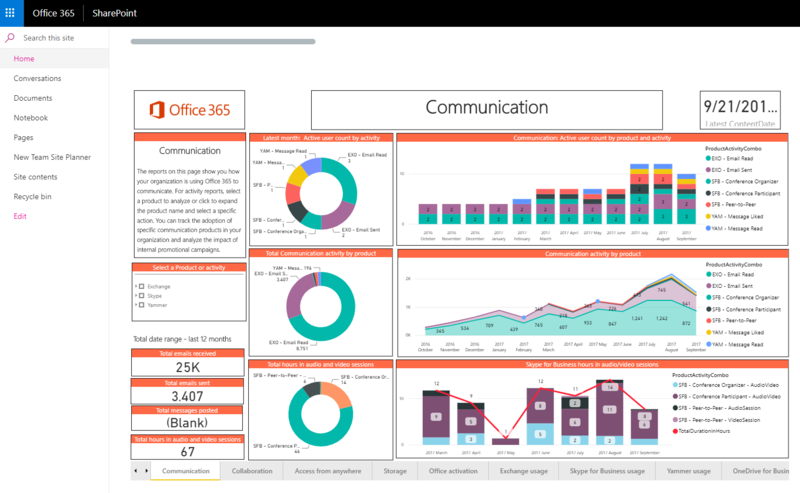 The Group calendar web part allows you to put an Office 365 group calendar right on your page so that it is easily visible to your readers. Use the Group calendar web part. The Hero web part is a great way to bring focus and visual interest to your page. You can display up to five items in the Hero web part and use compelling images, text, and links to draw attention to each. The Hero web part is included by default on Communication sites, but you can also add the Hero web part to other pages. Use the Hero web part. Use this web part to dynamically display content based on content type, filtering, or a search string. You can also set the scope of the search to a site or site collection, and sort the results. Use the Highlighted content web part on a page. Use the Image gallery web part to share collections of pictures on a page. Simply select your images with the file picker or drag them onto the web part. Once you’ve created your collection, you can drag and drop the images to reorder them as needed. Use the Image Gallery web part on a page. Have a book you want to recommend or promote on your page? You can share a preview of a Kindle book using the Kindle instant preview web part. Use the Kindle instant prevew web part. Haven’t used this, don’t even own a Kindle, sorry…. 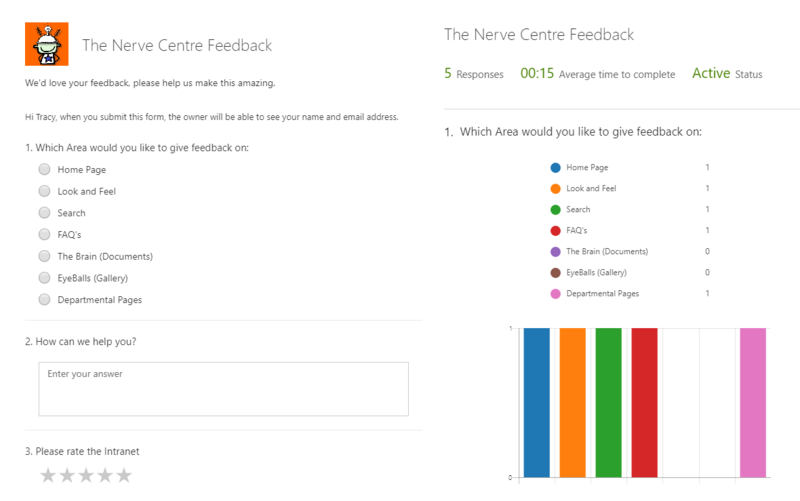 Use the Microsoft Forms web part to create surveys, quizzes, and polls on a page. You can also collect responses to your forms and show form results. Use the Microsoft Forms web part. 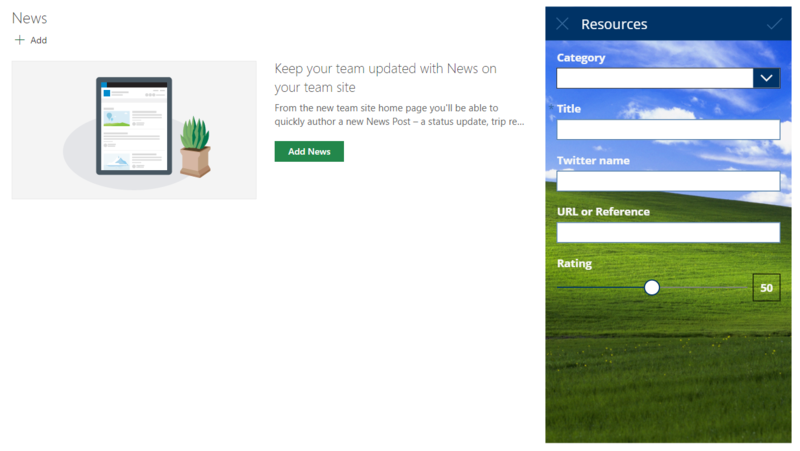 You can keep your team in the loop as well as engage them with important or interesting stories by using the News feature on your page or site. You can quickly create eye-catching posts like announcements, people news, status updates, and more that can include graphics and rich formatting. Use the News web part on a page. Use this to display a video right on the page from your organization’s Office 365 Video portal. Learn how to use the Office 365 Video web part on a page. Using this web part, you can “pin” items to your page for easy access. Use the Quick Links web part on a page. The Planner web part allows you to add your team’s tasks and assignments on a page using Microsoft Planner. Use the Planner web part. PowerApps is a service that lets you build business apps that run in a browser or on a phone or tablet, with no coding experience required. Once you have created or customized an app using the service, you can add it to your SharePoint page with the PowerApps web part. Just enter the app’s web address or the app ID, and then resize the app to fit the page. Use the PowerApps web part. Use the Quick chart web part to add simple charts to your page. Enter your data points, add labels, pick your chart type — column or pie — and publish. Use the Quick Chart web part on a page. This web part automatically shows recent activity on your site, such as files uploaded, edits made, lists and libraries created, and so on. Just add the web part, and the latest activity is pulled in automatically. Use the Site Activity web part on a page. The Sites web part allows you to showcase sites on a page. It will automatically show sites associated with a hub site, or if you are not using a hub site, you can select specific sites to show by searching for them, or choosing from recent or frequently-used sites. Use the Sites web part. This web part allows you to display a video right on your page from your organization’s Microsoft Stream video portal. Use the Stream web part. Use the Text web part to add paragraphs and tables to your page. Formatting options like styles, bullets, indentations, highlighting, and links are available. Add text to your page with the Text web part. With the Twitter web part, you can show tweets that are relevant to you or your audience right on your page. Use the Twitter web part. With the Weather web part, you can show the current weather on your page. Show the weather on your page. If your organization has an active Yammer network (for example: http://www.yammer.com/contoso.com), you can enhance collaboration by embedding Yammer conversations on your page. Use the Yammer web part on a page.